A Book Discussion with Reverend Wilson D. Miscamble, C.S.C. March 12, 2019 6:00 p.m.
Join us for a reception and discussion of American Priest: The Ambitious Life and Conflicted Legacy of Notre Dame's Father Ted Hesburgh with author Reverend Wilson D. Miscamble, C.S.C. and with First Things editor R. R. Reno. Considered for many decades to be the most influential priest in America, Rev. Theodore M. Hesburgh played what many consider pivotal roles in higher education, the Catholic Church, and national and international affairs. 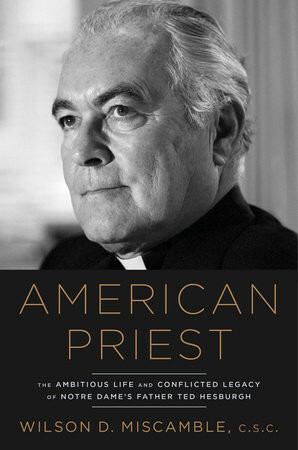 American Priest examines his life and his many and varied engagements—from the university he led for thirty-five years to his associations with the Vatican and the White House—and evaluates the extent and importance of his legacy. Author and Notre Dame priest-professor Wilson D. Miscamble tracks how Hesburgh transformed Catholic higher education in the postwar era and explores how he became a much-celebrated voice in America at large. Yet, beyond the hagiography that often surrounds Hesburgh’s legacy lies another more complex and challenging story. What exactly were his contributions to higher learning; what was his involvement in the civil rights movement; and what was the nature of his role as adviser to popes and presidents? This book was reviewed in our April 2019 Issue here. Reverend Wilson D. Miscamble, C.S.C. joined the permanent faculty in the History Department at Notre Dame in 1988. He chaired the History Department from 1993 to 1998. He also served as Rector and Superior of Moreau Seminary (2000–2004), the principal formation site for the Congregation of Holy Cross in North America. Fr. Miscamble’s primary research interests are American foreign policy since World War II and the role of Catholics in twentieth-century U.S. foreign relations.